An ultra-concentrated formula infused with Amino Acids, Biotin, Caffeine and B-Vitamins to visibly increase density of hair, whilst advanced technology supports the follicles to promote healthy-looking locks. Delivering gentle, yet effective cleansing to prevent damage to hair, the shampoo is ideal for slow-growing and thinning hair, or for weak fibres in need of strengthening and repair. Suitable for all hair types, including color-treated, you can expect denser, fuller-looking locks. Free from parabens and sulfates. An advanced scalp conditioning formula that aids healthy hair to leave fine, thinning tresses looking fuller and thicker. Combining an innovative form of Hyaluronic Acid with Amino Acids, Biotin and B-Vitamins, the conditioner addresses hair thinning and stimulates hair follicles to promote fuller-looking strands. Working to improve hair density and softness, the conditioner will leave locks looking fuller and healthier. Suitable for natural and color-treated hair. Free from parabens and sulfates. 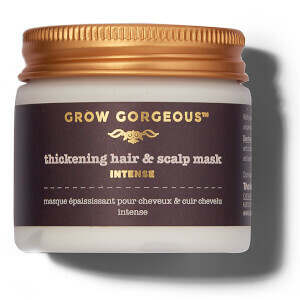 Visibly increase hair thickness and softly nourish your scalp with the Grow Gorgeous Thickening Hair & Scalp Mask Intense. The unique multi-mask is enriched with Amino Acids and Caffeine to thicken thin locks, feeding your strands with Biotin and Pea Peptides to ensure hair is healthy, thick and full looking. Designed to deeply hydrate without weighing hair down, Coconut Oil and Hyaluronic Acid intensely moisturize the scalp, keeping it in optimum condition to achieve ultimate hair health. Have only used one time but was pleased with the first usage - love the smell and how it made my hair feel - now I am looking for something from grow gorgeous on the order of a hair oil that I can use everyday without having to wash my hair. Not sure if that is what your serum is.